gives the logistic sigmoid function. Mathematical function, suitable for both symbolic and numeric manipulation. 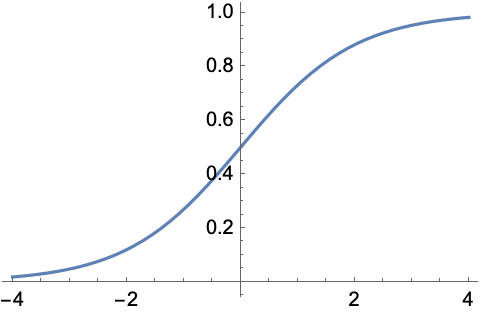 In TraditionalForm, the logistic sigmoid function is sometimes denoted as . The logistic function is a solution to the differential equation . LogisticSigmoid[z] has no branch cut discontinuities. LogisticSigmoid can be evaluated to arbitrary numerical precision. LogisticSigmoid automatically threads over lists.